What Does Code P0324 Mean? For the engine to generate power most efficiently, depending on engine speed and load and driver demand, it relies on the precisely-timed delivery of fuel and spark for a given amount of air. The engine control module (ECM) constantly monitors a number of sensors, using this data to modify, amongst other things, injector pulse timing and width and ignition spark timing. 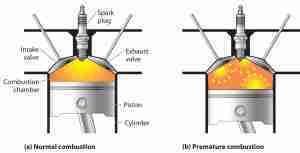 Generally speaking, the best time to ignite the air-fuel mixture is so that it generates the most pressure just as the crankshaft reaches a few degrees after top dead center (ATDC) for that cylinder, 14° ATDC for most engines. Because it actually takes a few hundred milliseconds for the entire air-fuel charge to ignite, the ignition spark needs to take place at some point before the cylinder reaches top dead center (BTDC), up to 30° BTDC for an engine at idle, and up to 45° BTDC for an engine while cruising. 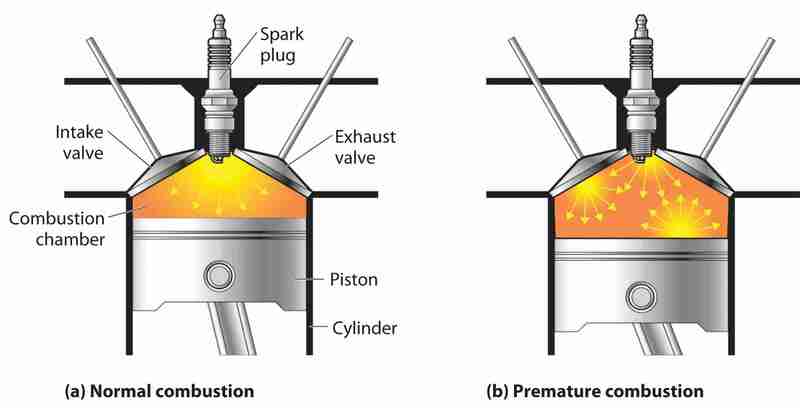 Ignition spark timing advance, however, is limited by a combustion phenomenon called “knocking,” also referred to as “pinging” or “spark knock.” Knock is caused by pre-ignition, in which the fuel is ignited by a hot-spot in the cylinder instead of by the spark plug. The result is two flames, one started earlier by the hot-spot, the other started later by the spark plug. When the two flame fronts collide, they cause a sudden spike in cylinder pressure, resulting in a sound which some describe as a bouncing marble or ball bearing. 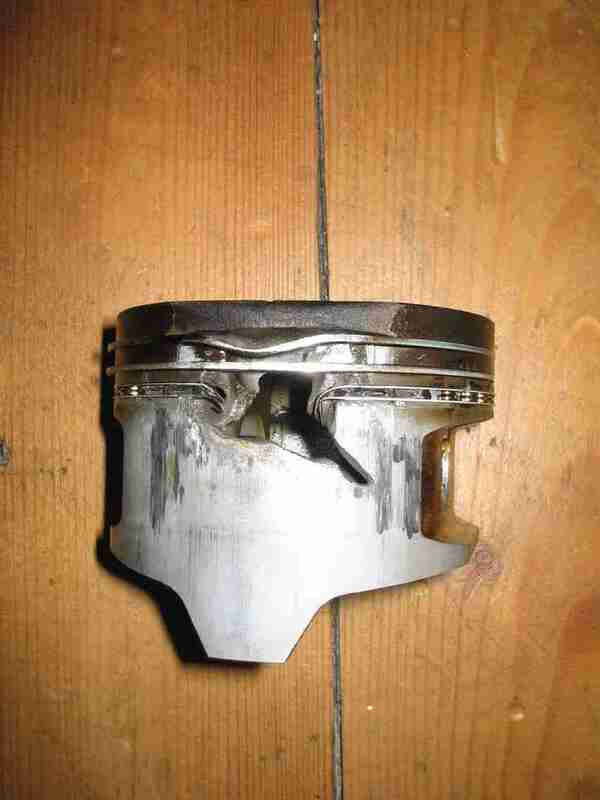 The effects of knocking range from an inconsequential pinging sound to total destruction of head gaskets, pistons, rings, connecting rods, bearings, or valves. To be clear, for the purposes of this discussion, this article refers to knocking due to abnormal combustion, specifically pre-ignition. This article is not referring to engine knocking due to mechanical problems, such as worn crankshaft connecting rod bearings or excessive valve lash, for example. The knock control system, an ECM sub-routine, uses “knock sensors” to detect the specific frequency generated by engine knock. 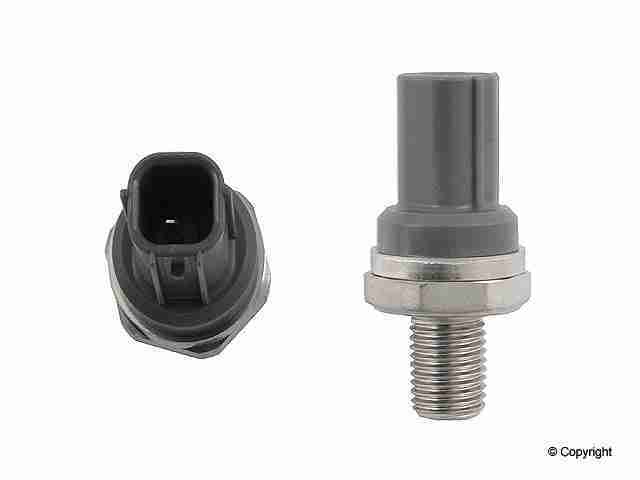 Usually, knock sensors are attached to a solid part of the engine block, but some may be connected to the cylinder head, where they can sense vibrations in the engine. A straight engine, i4 or i6, will have one sensor, while “V” engines, V6 or V8, will have one sensor on each bank. Generally, if the ECM detects that the engine is knocking, it will “retard” ignition spark timing, that is, fire the spark plugs later – 25° instead of 28° BTDC, for example. For a given engine speed and load, the ECM will adjust spark timing to keep it just outside of the knock threshold, or the range in which the engine knocks. What are the common causes of code P0324 ? Depending on year, make, and model, DTC P0324 may have number of causes. Here are some of the most common. Performance Engines – To extract the most amount of power from the fuel, performance engines generally run right at the edge of knock threshold, which means that if anything is off, such as low fuel octane, high engine temperature, or engine sludging, it will knock more than usual. Overheated Engine – If the engine is overheating, fuel will vaporize and detonate much easier. A stuck thermostat or low coolant level or flow could cause excessive engine knocking. Burning engine oil, an EGR leak, or incorrect spark plug could also cause overheating. Low Octane Fuel – Some engines are recommended to run a higher octane fuel than others, which means an extra expense on the part of the owner. To save a few bucks at the pump, one might opt for the cheaper grade, which sets the engine knocking all the time, particularly on acceleration. Some ECMs can put up with this, while others can’t. Always use the fuel recommended by the automaker for your specific year, make, model, and engine. Lean Condition – A fuel trim problem, such as a vacuum leak or clogged fuel injector, could also cause excessive engine knock. Severe Service – Car subjected to severe service, such as years of stop-and-go traffic, may develop carbon deposits in the cylinder, leading to hot-spots, which can cause engine knock. What are the symptoms of code P0324 ? If there is a problem in the knock control system, such as detecting no knock signal or detecting a knock signal all the time, the ECM will set DTC P0324 “Knock Control System Error” and illuminate the MIL (malfunction indicator lamp). Depending on ECM programming, you may or may not notice anything wrong with your vehicle, other than the MIL. Still, some ECM “limp-home mode” programming might fix spark advance to a “safe” point, so you may experience poor fuel economy, poor acceleration, or poor idle quality. The upside, of course, is that this safe point should prevent damage to your engine. How do you troubleshoot code P0324 ? There are at least a couple of ways that you can use to verify operation of the knock control system. Knock Sensor Tester or Oscilloscope – Depending on how accessible the knock sensors are, you may be able to use a knock sensor tester to see if it is generating a signal. With the engine warmed up and running, disconnect the knock sensor and connect the tester. Use a soft-face hammer to tap the engine block while the engine is idling, which approximates the frequency detected by the knock sensors. 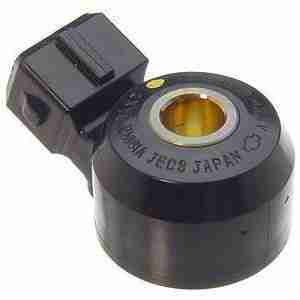 If available, optical or digital ‘scopes can also give you a direct view of the signal generated by the knock sensor, similar to the knock sensor tester. A DVOM (digital volt-ohm meter) may be also be able to detect this signal. If the tester lights up as you’re tapping on the block, and stops when you stop, the sensor itself is good. It may be that the ECM is not receiving the signal, so you’ll need to check for corrosion or open or short circuit problems in the wiring harness between the knock sensor and the ECM. If the tester doesn’t light up as you’re tapping on the block, the sensor is most likely dead. If the tester constantly flashes, whether you’re tapping or not, suspect another problem that is causing the engine knock, such as overheating, low octane fuel in a high octane engine, or a lean condition. Concurrent DTCs may help point you in the right direction. Scan Tool or Timing Light – If your scan tool can display a live data stream, you should be able to see the knock sensors and spark advance data points. Use a soft-face hammer to rap the If the ECM is getting a signal, it should retard ignition timing in an attempt to eliminate the knock. When you stop tapping with the hammer, the ECM should go back to normal advanced timing. Additionally, you should be able to see changes in knock sensor readings in the live data stream. Depending on engine design, you may be able to use a timing light to verify ignition timing. Similar to using the scan tool’s live data stream, you can use a timing light to watch for ignition timing changes as you attempt to simulate engine knock using a small soft-face hammer. If you see no changes in knock sensor status or ignition timing, then this means that the ECM is not getting a knock sensor signal. You may have a sensor problem or a circuit problem. Use a knock sensor tester or ‘scope to determine if the sensor is generating a signal. Use a DVOM or similar circuit testing tools to check for open or short circuits or excessive resistance in the circuit between the knock sensor and the ECM. None found. Ask a question about P0324. I HAVE A QUESTION, I HAVE A 2013 CHEVY CRUZ AND I WAS SITTING IN MY CAR WAITING ON MY KIDS TO COME OUT OF THE GROCERY STORE AND THE CHECK ENGINE LIGHT CAME ON SO THE NEXT DAY I WENT TO ADVANCE AND HAD THEM DO A DIAGNOSTIC TEST ON THE CAR. THAT LITTLE MACHINE SAID IT WAS A po324 KNOCK CONTROL SYSTEM ERROR . SO THEN THE NEXT DAY I GET IN THE CAR TO GO BCAK TO STORE AND THE LIGHT IS NO LONGER ON. NOW I LOOKED THIS UP ON MY COMPUTER AND IT BROUGHT ME HERE . MY QUESTION IS COULD IT HAVE CAUSED THAT LIGHT TO COME ON AND THAT MACHINE TO HAVE A FALSE READING THAT FIRST DAY CAUSE I HAD JUST PUT IN SOME CHEAP GAS , FILLED IT UP , AND WAS SITTING SO LONG WAITING IN THE CAR TILL IT MAY HAVE RAN HOT? OR WHAT ELSE WOULD HAVE CAUSED THAT LIGHT TO COME ON THEN GO OFF? AND WHERE DO I GO FROM HERE? THANK YOU. Below the intake manifold, near the starter on the back of the engine, near the firewall. You’ll have to put the car on jack stands or ramps to get to it. Knock Sensor Location Hope this helps.